Tucked away on lovely tree-lined block in vibrant West Harlem, this townhouse was built in 1899, recently gut renovated and now features brand new, state of the art everything! Located on the first floor of this newly renovated, luxurious, modern brownstone. The apartment has a private outdoor patio. The apartment is private, NOT A SHARE! This apartment is really large, super convenient, newly renovated, nicely furnished, and priced well This garden apartment in a classic modern brownstone on a great, quiet, safe block in vibrant West Harlem, ONLY 15 minutes FROM MIDTOWN. 4-minute walk to the 1 train, and a 4-minute walk to the A, B, C, D subways to all tourist destinations. Harlem is a multi-cultured neighborhood that is home to The Apollo Theater, The Dance Theater of Harlem, & many more attractions. There are have many cafes, bars, and restaurants close by. Some of these are: Harlem Public, The Wallace, Uptown Bourbon, Maison Harlem, Bono Trattoria, The Grange, Café Latte II and Oso.. We are minutes from City College, Columbia University, Borica College, St. John the Divine and Grant's Tomb. Take a trip uptown and see the magnificent Cloisters, The Hispanic Society of America Museum, and the Jumel Mansion. This is a diverse, lively, and vibrant neighborhood with plenty of history, culture and charm, so come and stay with us and make yourselves at home, you will not be disappointed and will want to come back for more! No smoking is allowed in the apartment or on the patio of the apartment. No pets allowed! The apartment has a large tiled kitchen with stainless steel appliances, complete with stone counter tops. It has all you will need to cook and provide for your family including cookware, flatware, dishes and many more necessary kitchen utensils. To start your mornings off you have Nespresso, Coffee and tea provided. The large bedroom has a queen size bed leading to an outside patio. The sofa in the living room is also and queen size sleeper sofa. Linens are provided for all beds. The bathroom has a 6 foot tub to relax in and the toilet is comfort height. flat screen cable TV, high speed WIFI, All premium channels and cable. Includes supermarket/s, pharmacies, banks/ATM, restaurants, wine shop, bars & pubs etc. these are within a few blocks of the apartment. We are a family of 5 and we love our newly renovated home and know you will too. We have lived in Harlem the past 18 years and love everything it has to offer and its diverse culture. We also the love many great changes taking place, like new stores. restaurants, bars, cafes and live entertainment. We were raised in the neighborhood, and had been looking to purchase a brownstone in the area for a few years, and we finally settled on this property. We were excited and overjoyed at the opportunity to purchase and renovate it, because of the changing neighborhood. It took almost 2 years, and it is finally complete for us and you to enjoy and call home. We hope you, our guest love it as much as we do, when they come to visit. A Large Luxurious Private Apartment with separate Private Entrance, Secure, Modern Design, Quiet Neighborhood, Safe Oasis, Private Patio, relaxing home away from home for your enjoyment in a vibrant, exciting, multi-culture neighborhood. A large bathroom. A 6 foot bathtub to stretch out and relax in. Bath Shower combo, large sink, comfort height toilet (not like you are sitting on the floor). Towels, rags, soap. Wonderful, spotless, beautiful, safe, modern, bright and warm apartment. We had the best week staying at Michael and Golda's apartment. The apartment is very spacious and beautifully appointed. It was so clean and comfortable and had everything you could possibly need for a stay. Our hosts were so friendly and welcoming and extremely helpful with information needed at any time. It was such a lovely spot to end each busy day after exploring the city of New York. Highly recommended! Mel, it was such and pleasure to meet you all. Thank you for the review. We had a great experience!! The first day they recived us with the biggest smiles and gave us tips of where to eat, what subway we should take.. The house is very nice!! Thank you so very much for staying with us and we are happy that you enjoyed your stay. My husband and I decided on renting this apartment mainly because of the washer and dryer, and because Golda and Michael put an emphasis on cleaning the apartment, by charging a cleaning fee. We felt much better knowing they put extra effort into the cleanliness of the apartment! The apartment had all the necessities we needed for our 10-day stay, and Michael spent time with us, just like others have said, to explain where the closest Subway stations were, and which restaurants he recommended. It was quiet, and we were able to sleep better than we have in a long time! I also loved the basket of books in the bedroom! Thank you so much for letting us stay in your home. We feel like we were able to get a true NYC experience by staying here. We were also able to rent a car and visit Tarrytown, Sleepy Hollow, and New Haven, CT. We hope you'll come visit Utah soon! Hello, It was a pleasure having you stay at our home. We enjoyed meeting you both. I'm happy that the washer & Dryer was to your liking along with the cleanliness of our home. That's important to us and I'm happy to hear that you approved. Thank you for staying at our home and even better, writing a review. We love to hear from our families along with their comments. We hope to see you both again. Awesome place with friendly hosts. Close to the subway. Absolutely recommend! It was a pleasure having you both stay at our home. Thank you for the review. So glad to hear that you both had an awesome time. We hope to see you again.. I took my son and daughter to NY and it was a great trip. 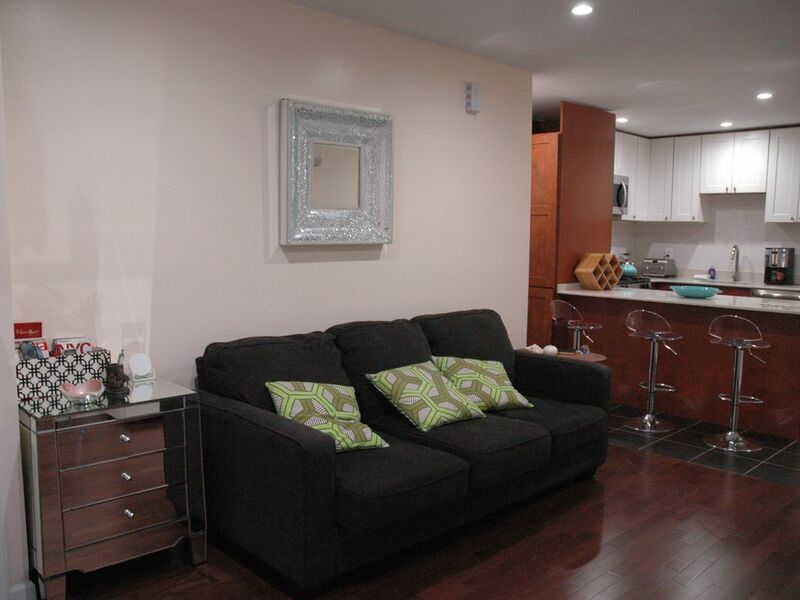 This apartment is quaint, charming, clean, updated and we will definitely be repeat customers. Flew into JFK took air train to subway and subway straight to appt. Owners we so nice. Loved, loved, loved the appt. Hi Family, The time went by quickly. for both of us...The kids will be all right. Thanks for the great review..
Riverbank State Park - A large and beautiful park with great views. It has a full size track for running, or jogging, Skating Rink for ice skating in the winter, or just walk in the park and enjoy the scenery of the Hudson and the New Jersey skyline. The park has a restaurant, which serves a fantastic brunch on weekends. • Rates are higher during the Holiday Season: The month of December until New Years. Inquiry for exact rates.